Blessed for Shore is a beautifully manicured rental house in North Myrtle Beach, South Carolina. 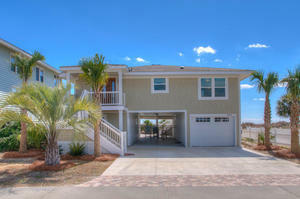 You will feel right at home during your beach vacation when you choose to stay in this beautiful home. 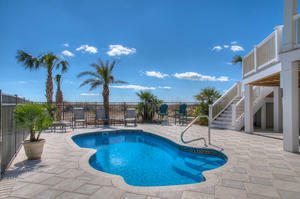 Although it is elegant and homey, the interior still manages to exude the tropical beach ambiance of North Myrtle Beach. This rental house has five bedrooms and an amazing four bathrooms. Two of these bathrooms have showers, and two of them have tubs, effectively meeting the needs of everyone. Blessed for Shore is extremely versatile and perfect for a number of different groups and functions. There is a fully equipped kitchen with stainless steel appliances to make cooking for your group a breeze. Hardwood and tile floors throughout this South Carolina rental also make for easy and effortless clean up. The outside shower is another element that will make clean up in this house uncomplicated, because that should be the least of your worries on your Myrtle Beach getaway. This vacation home also has a gorgeous oceanfront view off of the master bedroom. For those guests that want to take a private dip before heading to the beach, there is also a swimming pool available at Blessed for Shore. There is a great balcony with an exceptional view that also comes equipped with a charcoal grill. When visitors finally tire of the beach and the attractions found in the area, they can find entertainment in one of the flatscreen TVs sprinkled throughout the home. Myrtle Beach offers so many attractions to tourists of all enthusiasms. There are guided tours of the Lowcountry, as well as dolphin cruises. This particular rental is very close to Cherry Grove Pier where visitors can try their hand at North Myrtle Beach fishing, perhaps catch something to throw on the grill that very evening. Golfing and shopping are also available in great abundance in the area. 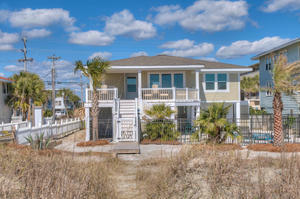 This posh beach house could not possibly be more ideal for your family vacation in North Myrtle Beach.